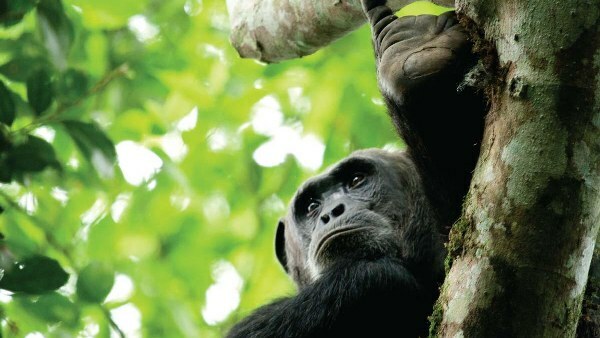 The 6 Days Bwindi Gorillas & Kibale Chimps Safari is one of the excellent safaris 0rganised for you to explore the natural wonders in Uganda .The 6 days Bwindi Gorillas & Kibale Chimps Safari offers you a unique chance to have life time experience with the world endangered primates species housed in the naturally gifted protected parks in Uganda the pearl of Africa. The highly rewarding safari starts and ends in Kampala /Entebbe and it takes you through Uganda’s primate Capital- Kibale forest park for memorable Chimpanzee trek, thereafter, it links you to Queen Elizabeth national park where you may enjoy the marvelous sights and views of different fascinating primate species and other wildlife species like the rare tree climbing lions only found in the Ishasha sector of Queen , elephants ,leopards, buffalos and explore the highly adventurous Kazinga channel on boat cruises. Thereafter Queen Elizabeth national park, you will traverse through the splendid Kigezi hills to stunning Bwindi Impenetrable national park where you will have the highlight of your safari by having a long awaited opportunity to trek the world endangered species of the mountain gorillas in their natural habitat of Bwindi Impenetrable National Park in Uganda. Early in the morning after breakfast, you will meet our English speaking safari driver guide who will pick you up from your Kampala/Entebbe lodge/ hotel and depart to Kibale forest park dubbed the primate Capital of the world. The drive distance of 358 about 4-5 hours’ drive will take you through the astounding country side landscapes dotted with farmed lands and local homesteads. Arrive in Fort Portal town also dubbed the Tourism City of Uganda for lunch after which you will continue to do the Fort Portal Crater Lake Hike to gain magnificent views and sights of the remarkable Fort Portal explosion craters. You will also tour the stunning Amabere g’ Nnyinamwiru caves with a magical Nyakasura River falling over them forming splendid water fall. The caves have breast like features which the locals attach a great cultural connotation and are thought to date back to the Chwezi era. Thereafter, Retreat from the activity and drive through Fort Portal Town to Kibale Forest Park just distance of 26 Kilometers to Check-in to your lodge, have dinner and overnight. Take an early morning cup of coffee and thereafter transfer to the park headquarters for an early morning briefing about the dos and don’ts of Chimpanzee trekking encounter in the primate Capital of the world – the Kibale National Park. 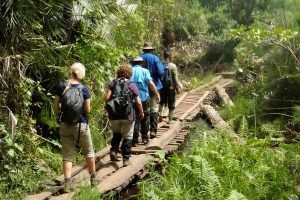 Thereafter, you will walk through the forest with an experienced guide who will be enlightening you about both wildlife and plants life. As soon as you come across the chimps, you will be allowed one memorable hour to interact with the primates. 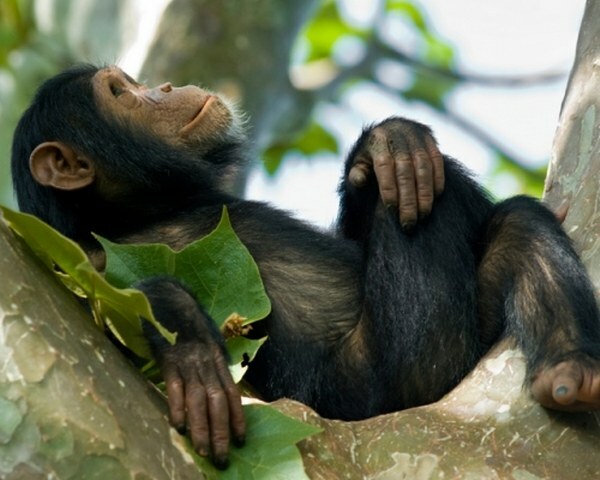 The Chimpanzees will lure you in a state of amazement as they swing through the branches, make pant hooting calls, play with each other, and imitate your body language along with other features that will make your one full hour with them a memorable experience of its own. Retreat from the activity which tends to take 2 – 5 hours to embark on the transfer to Bigodi wetland. The Bigodi wetland, lies in close distance to the park thus connecting there is less hectic. The Bigodi wetland walk exposes you to typical eco –tourism encounter in Uganda. The impressive flora and fauna existing along with the local community is indeed rewarding to encounter. The sights of great blue turaco and the Sitatnga may not be missed. Retreat from the activity back to lodge for relaxation dinner and overnight. Following an early cup of tea, depart Kibale national park heading to Queen Elizabeth National Park 157km about 3 hours’ drive excluding en-route stopovers. You will have your first stop at Rwenzori Art foundation which is the only bronze casting center in the whole of African Continent that is located in the shadows of Rwenzori Mountains. You may participate in the wonderful process of sculpture making of which is the common activity done in the Centre. Sparing time to tour the Ruboni community wax and craft center exposes you the local traditions and the usage of local knowledge to contemporary development. Thereafter, proceed to Queen Elizabeth National Park, driving through the crater which affords you views of the wildlife like olive baboons and elephants not forgetting magical sceneries before connecting to Mweya for an afternoon Kazinga Channel boat cruise which will offer you possibilities of encountering Hippos, Nile crocodiles, wild game drinking on the channel side and counts of water birds. Retire in the evening for relaxation, dinner and overnight. Day 5 of the 6 Days Bwindi Gorillas & Kibale Chimps Safari: Do gorilla trekking & an evening Cultural walk to the Batwa Communities. After breakfast, embark on the transfer to Kampala. The long drive of 527kms will take you through hilly countryside of south western Uganda before approaching Igongo Cultural center 12km past Mbarara town for a traditional thrilling lunch .Thereafter; you will proceed to have another stop at Uganda Equator Crossing Kayabwe for amazing photo shots and water experiments. Afterward continue with the drive arriving in Kampala in the evening and the driver guide will drive you to your Kampala hotel or Entebbe international airport for your flight back home.